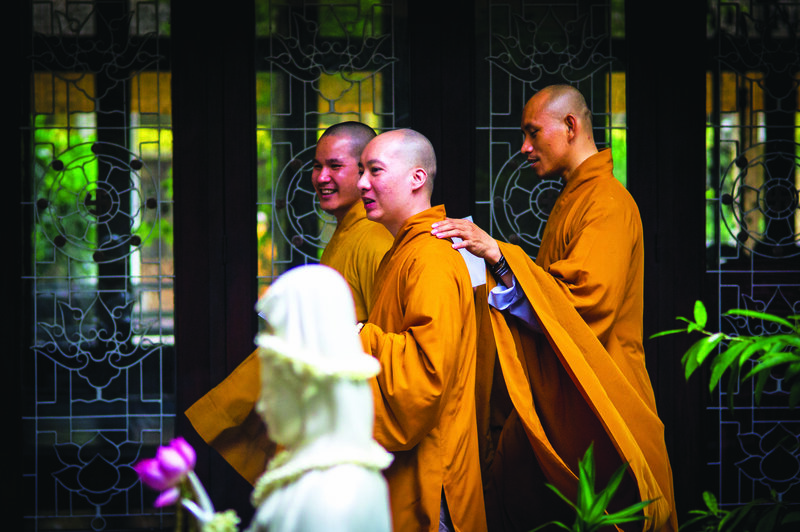 Ha Van Thanh is set to become a monk in a month. There is still hair on his head, but not much. He shaved it off with a trimmer recently. He still goes by his birth name these days, but soon he will be given a new one when he becomes a Buddhist monk. For the past two months he has been living in a Mahayana Buddhist temple on the border of Binh Tan and Hoc Mon to prepare for the induction ceremony that will see him and 14 initiates become new monks and nuns at the Hoa Anh Temple. Two major extant branches of Buddhism are generally recognized: Theravada (The School of the Elders) and Mahayana (The Great Vehicle). Theravada has a widespread following in Sri Lanka, Cambodia, Laos, Thailand and Myanmar. Mahayana is found throughout China, Korea, Japan, Vietnam, Singapore and Taiwan. Thanh’s 14 peers all come from devout Buddhist families whose parents were proud of their children’s decision to enter monkhood. Thanh’s parents, however, reacted differently. His father has renounced him in name. His mother, the more compassionate 48 of the two, still comes to the temple every other day to visit her son. “She hopes to talk some sense into me and dissuade me from entering monkhood. She can’t understand why I would want to spend the rest of my life as a hermit, chanting Buddhist sutras and doing good deeds for people who aren’t of my own blood.” He is the only one in his family who practices Buddhism. Thanh is 21 years old and is the only son of an affluent Vietnamese family. His father is a successful businessman. His mother is a socialite amongst the Vietnamese wealthy circle. Thanh is currently attending a private university on a scholarship in Thailand. When he graduates with a bachelor in business administration he is supposed to take over the family business, the heir to his father’s fortune. Ha Van Thanh is set for a future among Vietnam’s rich and elite, which makes his choice to reject it in favor of an austere, monastic life a shock to his parents.